In the world of investing there is a saying that is applied to difficult moments, such as the recent global stock market falls that have seen many people lose money over a short period – “Sometimes, doing nothing is best”. The point is that a market fall shouldn’t prompt panic, especially if you have invested your money for a long-term period. Because if you’re in the right place and going in the right direction, a short-term bump shouldn’t ultimately detract from that purpose. In football circles that principle is easier said than done for some chairmen. Witness Peterborough owner Darragh MacAnthony sacking manager Dave Robertson on Sunday. The Posh have started the season badly, and they have ambitions of getting promoted. They’ve made 10 signings and shipped 13 out, but there has been little patience afforded to a manager who was only appointed last May, signing a three-year deal. It is a harsh sacking, but not a surprise in modern day football. When teams struggle or have bad patches, few owners can adhere to the “doing nothing is best” principle. Doing something apparently shows strong leadership, because doing nothing would suggest an acceptance of poor results. The bigger picture is often lost when short-term panic reigns. As Phil Parkinson comes close to agreeing a new contract in West Yorkshire, there are clear signs of stronger leadership at all levels of Bradford City. Whereas the Bantams’ own slow start to the season has offered excuses to delay negotiations, the joint chairmen, Julian Rhodes and Mark Lawn, have retained focus on the long-term. Parkinson has proven to be the man to take the club forwards over the past four years, and a few indifferent early season results do nothing to change that. The retention of Parkinson will remove any uncertainty that would otherwise creep in over the coming months, with his current deal expiring next May. Typically, Parkinson is ensuring that assistant Steve Parkin and Head of Sports Performance, Nick Allamby, are looked after too. He very much sees it as a team effort and clearly places huge trust in the staff around him. Over four years they have done great things together, and they will be confident that there is more to come. What has always stood out about Parkinson’s management is his long-term thinking, which has resulted in his stamp being firmly placed all over the club. In his first season (2011/12) he inherited a squad that probably wasn’t as poor as legend now has it, but which was undoubtedly a long way short of pushing for promotion from League Two. City made hard work of avoiding relegation that year, but much of that was due to Parkinson ripping up everything he didn’t like and instilling his methods. Short-term pain, for long-term good. A year later City were promoted and benefiting from the manager’s foresight in getting the basics right in 2011/12. The legendary former Manchester United manager, Sir Alex Ferguson, was known for taking a similarly dual outlook. His priority was of course victory on a Saturday, but those who worked with him talked about how Ferguson would be equally focused on the months and years ahead. Of maintaining Manchester United’s dominance of English football by continually rebuilding his team when needed, so that it stayed ahead of the field. There were transitional periods where United fell behind others for a season or two, but under Ferguson they always came back strongly. He built four or five brilliantly successful teams. His achievements are unsurpassed in football’s modern era. 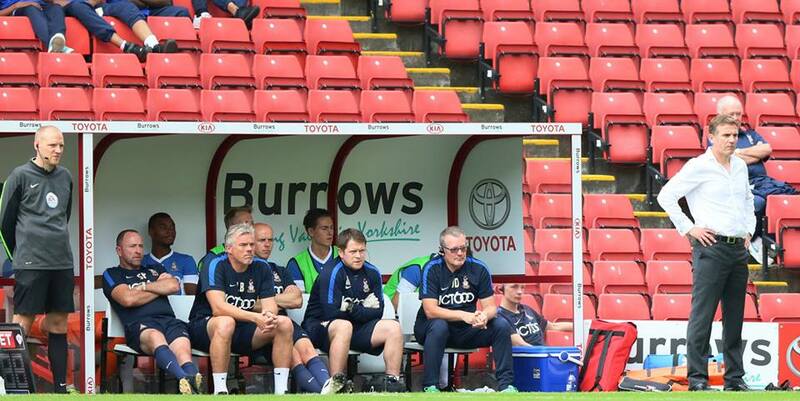 On a very different level, Parkinson has so far been doing something similar at Valley Parade. In City’s third season since the History Makers year, just four players from that side remain at the club and yet upwards progression has been continued. Parkinson will probably know that, in hindsight, he kept faith in the League Two promotion heroes a little too long. Yet whilst we supporters were allowed to be sentimental and express doubts about the exits of Gary Jones and Nathan Doyle, Parkinson ultimately recognised that City needed to keep moving and raise the standards further. He does not have anything like the resources that Ferguson had, but Parkinson has been able to ensure that City continue improving. Even this summer, three of the four goalscoring heroes from the famous Chelsea victory have left the club. Life goes on. Looking in from the outside, this summer appeared to be chaotic. Eight outs, and 13 ins. Parkinson has overseen a major overhaul to a squad that last season surpassed expectations. Like the summer of 2014 there were players that have been let go who we supporters would have kept, and the wisdom of making so many changes has yet to be proven. Like the summer of 2014, it would probably have been easier for Parkinson to have retained the likes of Andrew Davies, Andy Halliday and Jon Stead. But he is not managing this club with the sole objective of winning the next game, he is thinking bigger. Whilst the new-look squad has struggled to gel in the early weeks of the season, there is no doubt that decent money has been committed and that quality has been brought in. Many of the new signings are yet to justify their worth, and it has made for a difficult watch at times, but in Parkinson City have a manager who has the experience and composure to get through such stormy moments. And crucially, he has the conviction in his own decision making. Walter Smith, who in two spells in charge of Rangers enjoyed incredible success, observed about management, “You have to know that there will be times when you will make the wrong decision and you have to have the strength of character to carry on and continue to pursue the goals that you originally set out.” This rings true for Parkinson right now. Of those eight players let go and 13 brought in, not every decision will in time prove to have been the correct one, but it shouldn’t detract from the reasoning behind it. It’s easy to forget now, for example, that it took Gary Liddle six months to justify the logic of letting Gary Jones leave. Continuing to move forwards over the long-term is the key point. It would be easy to look back on last season’s seventh place finish and judge that, but for the fatigue caused by so many cup games, City would have grabbed the extra few points needed to get into the play off spots. But even if the Bantams had finished one place higher, it is highly unlikely they would have got past Preston, Sheffield United and Swindon in the play offs. And even though League One looks weaker this time around, there are no guarantees that City would have finished higher this season with largely the same team. Perhaps seventh was an over-achievement for that particular side. Certainly, for all the positives of last season, Parkinson did not ignore the minus points. The limited number of goals, the over-reliance on the injury prone Andrew Davies, the lack of leadership, the failure to see out narrow leads. Parkinson wanted better and has set about addressing these failings. Walter Smith originally joined Rangers as assistant manager to Graeme Souness, and he made the point that to keep moving forwards you must keep raising the playing standards and pushing the squad. A year after Rangers had won the league (1986/87), they failed to invest in the team and moved backwards for a year. The same fate has more recently afflicted Manchester City in the two seasons after they won the Premier League. There are signs that Chelsea too were in danger of going down the same route last season. Parkinson’s worst transfer window performance at Valley Parade was the one that followed 2012/13’s promotion. He made five signings, but they were largely back up players replacing back up players, rather than an improvement on the first team players he had. Soon after came the beginnings of the one win in 21, which began to show the History Makers had gone stale. In January, that season Parkinson used the loan market reasonably effectively to shake things up, and results eventually improved to the extent that City finished 11th. Yet City had been in a position of strength in 2013 and not kicked on as much as they could have. This summer has firmly proven that Parkinson has learned the lessons from this. And it comes back to the strong leadership at the club that have allowed this to happen. If the club’s board panicked in the short-term in the way many supporters have early doors, Parkinson would be under pressure regardless of his long-term track record. Parkinson has not shied away from publically accepting the blame for the club’s slow start, but he knows that he has the backing of his bosses – which is what really counts. Witness further money being made available to bring in Brad Jones, Lee Evans, Reece Burke and Devante Cole. Perhaps the board has learned the hard way; learned to trust Parkinson because of his track record. When his predecessor, Peter Jackson, resigned early into the 2011/12, it was clear that he felt under too much pressure from those he reported into, and that he couldn’t work under such circumstances. It is rumoured that Lawn gave Jackson a huge dressing down less than an hour after a home defeat to Dagenham that would prove to be his last game in charge, and that a tough examination during a board meeting that followed, a few days later, was too much for Jackson to bear. Whilst history has shown that situation worked out for the best, you hope that lessons were learned and that when Parkinson is feeling low he can rely on the support of Lawn and Rhodes to keep him going. They are right to ask questions of him when things aren’t going well, but they have a big role to play in shaping success and they appear to be contributing in the right way. Those who run football clubs need to be strong and stress that if the right things are being done, they should not be changed just because they haven’t come to fruition yet. Time will tell if this new-look squad can build on last season’s achievements, and there could be more short-term bumps in the road over the coming months. But after the hugely encouraging signs of 2014/15 that saw City begin to knock on the door to the Championship, Parkinson has taken a bold approach to revamping the squad with the aim of it being better equipped to bang louder. He has talked about how he has set out to ensure that he has quality on the bench to turn games, something he felt was lacking last season. This does look a stronger squad overall, it has been upgraded. Promotion might not happen this season, but City are moving in the right direction. Parkinson has the resources to plan ahead, the patience of his board so that his plans have the time to come to fruition, and the experience to guide the club through difficult moments. These are exciting times for the club, and with Parkinson at the helm there is every reason to believe that the upwards progression of the last four years will ultimately continue. Quotes from Walter Smith are borrowed from Mike Carson’s excellent 2013 book ‘The Manager’. Interesting point about Jackson’s dressing down from Lawn. You would think Parkinson – who always seems to listen and think before he speaks – would be able to bring a calmness and practicality to those situations where others might be being emotional and irrational. There’s always a danger of familiarity breeding contempt with a manager and you’ll notice that people have been quick to blame Parkinson for our inability to gel at the start of this season. Parkinson however took it on the chin, repeating in various interviews that he was to blame and the fans were right, vowing to fix the problems in front of him. I think shows the macro level of responsibility he feels he has and it shows that he likes to protect his players – just like Fergie did. After a shaky start I am well up for this season. This is probably one of those squads that will be looked at in retrospect as being one for which the boat was pushed out, which is what everyone wants – so in my house, I say well done to all and let’s hope the ink is on the contract soon. great read and it puts our early form into context. One of Parky’s objectives will be to ensure 18k customers renew their tickets next season. I think despite missing out on our nu 1 targets to replace Andrew Davies we seem to have finally got their through the loan market. Let’s hope we can keep Burke until the end of the season. Really good status summary once again Jason. Most organisations in any field work to a longer-term (eg 5-year) plan and some noise from a very small minority of customers when things go bumpy has to be taken in context. Sacking anyone is a last resort and is a collective failure, and indeed in any annual review of performance made over the past 4 years the summary would have to be “excellent progress achieved” for the club and therefore for all of its Directors, staff, players and other stakeholders, including the fans (the volume and intensity of support improvements are part of the equation also). I personally love the fact that we clearly have a long-term vision and plan, and have the resolve to stick to it because it’s the right thing to do. We need to recognise that we are in fact lucky to have Phil, Steve and Nick working as an effective team to deliver the plan, as many other clubs and their fans would love to be in a similar position right now, having enjoyed a sustained period of progression. The sooner they sign a contract the better for me. As for the emotional disappointment of the odd bad game or result, I’ve seen everything in 53 years at VP and they all hurt but to be honest the hangover goes quickly now, reflecting that I have confidence that we’ll put things right quickly and move on, and trust me it wasn’t always this way.